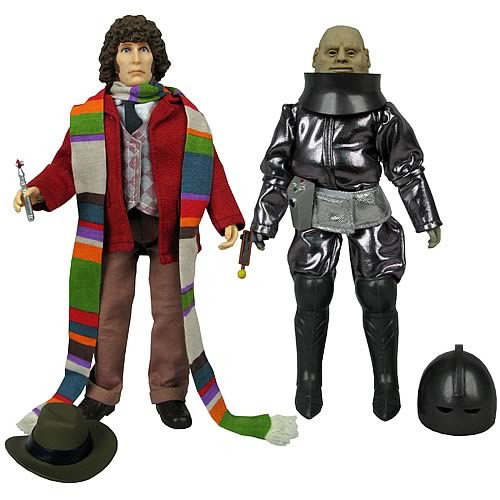 Includes Tom Baker as Doctor Who and Sontaran Field-Major Styre! Entertainment Earth Comic-Con Debut! Travel through time and space with Doctor Who! Reminiscent of the best-selling action figures of the 1970s and 1980s, Bif Bang Pow! 's amazing Doctor Who figures stand 8-inches tall and feature episode-specific fabric clothing, in addition to multiple points of articulation. Based on the incredibly popular television series, they embody that distinctive look and feel of the longest-running sci-fi TV series in the world. The Doctor Action Figure showcases actor Tom Baker dressed in an unforgettable costume, complete with hat, scarf, and sonic screwdriver accessory. The Doctor is an alien, one of the powerful Time Lords from the planet Gallifrey. He is an intrepid traveler in time and space, armed only with his incredible intelligence and his fix-anything sonic screwdriver. As a Time Lord, his body also has the ability to regenerate if he is fatally wounded, becoming a new man each time. The Fourth Doctor masked his brilliant and inventive mind behind a façade of bohemian eccentricity. The longest lived incarnation of the Doctors so far, he was finally forced to change his body after losing a fight with his old enemy the Master and falling from a radio telescope to the ground beneath him. Right out of the serial "The Sontaran Experiment" starring the Fourth Doctor, Field-Major Styre comes with two accessories, a pistol and a communicator... plus, his helmet is removable! The Sontarans are diminutive cloned warriors, bred only for way, death and victory. A Sontaran would choose death over life at any time, provided it furthered their race in winning their endless war with the Rutan Host. Sontaran Field-Major Styre was conducting a series of brutal experiments on a team of astronauts he had lured to the deserted surface of Earth in the far future. Styre's experiments were a prelude to a planned Sontaran invasion of Earth, which only the Fourth Doctor was able to stop.